I've been studying home decor books for about two years. Before blogging I decorated my house by the seat of my pants. I bought what I liked and when Sweetheart and I remodeled our home in 1990 I did hire an interior designer for some suggestions. I did learn a lot about color flowing from one room to the next. NOW I read and purchase design books from the Goodwill and love to study the different styles. I have decided I love Country ~ My version of Country. My version of French Country. I know I don't have all the elements for a real French Country Kitchen, but I love my kitchen and I can't afford to do any major changes at this time in my life. I think about remodeling the kitchen to a more a authentic French Country Kitchen and all I vision is the physical work that does into a redo, plus the $$$$. All that said and done~Let's play make believe and decorate My Cozy Corner for Fall. At My Cozy Corner the front door opens right into the living room. 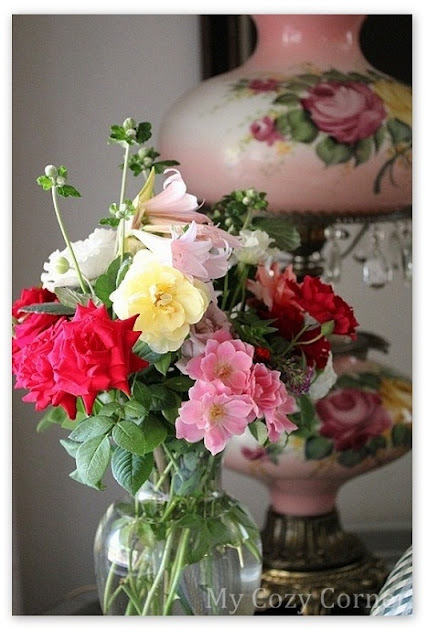 A floral arrangement is set on a table to signal hospitality to everyone who enters the front door. My country living room is truly designed for comfort. The room is physically welcoming with amply stuffed furniture that encourages people to sink in and relax. There is a grouping to accommodate six people, plus extra chairs if needed. Comfort and personality with a decorative interest. Our fireplace with its mantel is the perfect showcase to display a theme for our living room and expressing personal interests. Consider where beverages will be placed. Two coffee tables and four end tables provide plenty of places to sit a beverage, snacks or dessert anytime of the day or night. Gather books and place them on tables, mantel or shelves to display well-worn spines. My country living room lighting is very quaint. Stiffel and vintage lamps, and candles provide lighting for cozy reading corners. Make your home a reflection of you. Be fearless and love how you live. Day-to-day use is a priority for my country living room. I want to share meandering conversations with loved ones or curl up on a deep-cushioned sofa with a cup of tea while listening to music. I will be visiting some great folks and hope you join me. Thanks again and please come back to visit. Everything looks so pretty! I think that it's very satisfying to decorate for yourself and not just follow trends. Your home looks very cozy! Looks very warm and friendly- thanks for linking to "Open House". Hi Betty! I was on Pinterest and it brought me to your beautiful home! I love your pretty flowers and all of your Fallness going around in your lovely home. Oh dear Betty, I love all your ideas, specially the cloche ones around the house. Very Fallen look every where. Happy Seasonal Sunday. Oh...your header for fall is gorgeous too! I love all your fall decorations and "fluffing." The fresh flowers make my heart go pitter-patter. I like all your ideas; it's always helpful to get seasonal decorating inspiration from others. I can't wait to start that very thing at our house. Visiting from Seasonal Sundays; have a wonderful weekend! 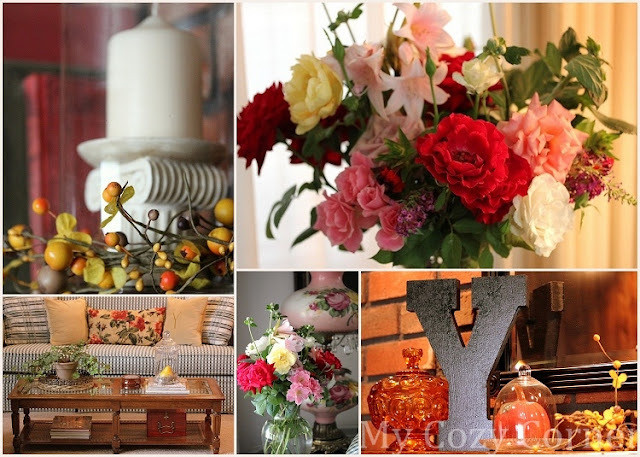 Wonderful decorating suggestions! Love all your autumn colors and your mantle is lovely. What beautiful splashes of Fall, Betty. You've created such a warm and inviting space ... love it all! Oh I have very much enjoyed seeing your lovely home and your ideas for colorful vignettes. It is all so warm and cozy. How wonderful to figure out your decorating preference. I have yet to figure mine out exactly. Absolutely wonderful! I love French Country too! I think your decorating ideas and elements are on track! I will be featuring your post this week at Home and Garden Thursday - I appreciate you sharing! I'm a bit late getting into the swing of fall. Thanks so much for your great tips and helping me get in the spirit of autumn!